Our trails and grooming needs your support to keep a well maintained and excellent riding adventure. 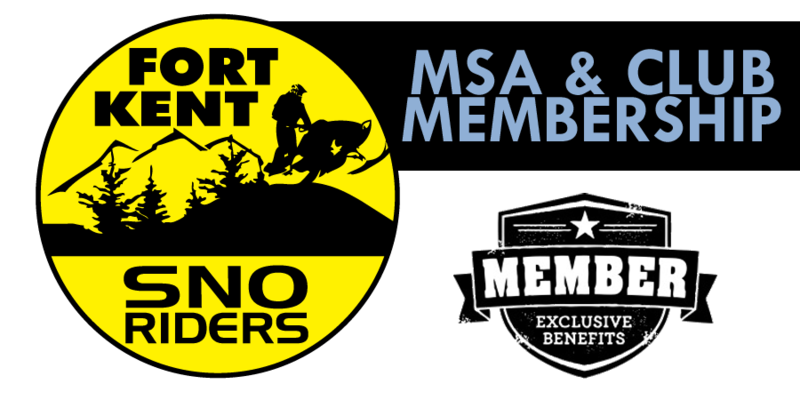 Fort Kent SnoRider and MSA Memberships Run from Oct. 1-Sept. 30. Memberships submitted at this time will be valid for the 2018-2019 season, and expire on September 30, 2019. Members receive a subscription to the Maine Snowmobiler newspaper, a membership decal, a club decal and membership card and become eligible for the MSA scholarship program (must be a member for 2 years, and enroll by January 1 of the current season). Fort Kent SnoRiders Memberships Run from Oct. 1-Sept. 30. Memberships submitted at this time will be valid for the 2018-2019 season, and expire on September 30, 2019. Members receive a club decal and membership card. Members are also recognized at clubhouse and receive monthly club updates. Resident $46.00* *Fee includes $1.00 agent fee. Proof of payment of sales tax required for new registrations (Maine residents only). You can register your sled either online at https://www10.informe.org/ifw/atv-snow/ or at a Maine Town Office. If you are traveling to Fort Kent, you may register at the Fort Kent Police Department (207-834-5678) 24 hours a day.